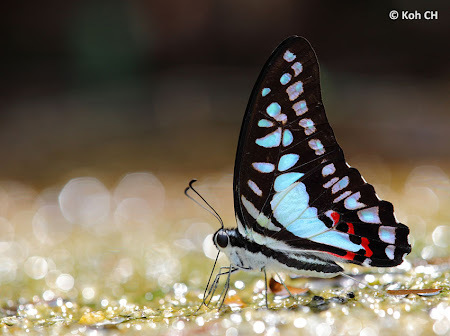 Butterflies of Singapore: It's a Bird! No, it's a Butterfly!! Recently, during a visit to the California Academy of Sciences tropical rainforest conservatory in San Francisco, a young boy next to me exclaimed to his mother, "Look, mommy, a pretty Blue Jay!". 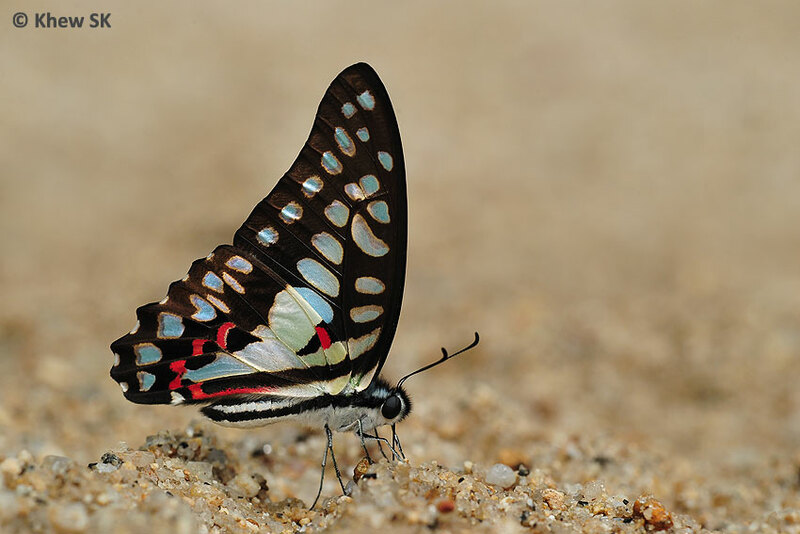 I turned around quickly, expecting to see a fast-flying individual of Graphium evemon that I am familiar with. But no, it was a bird. Pretty no doubt, but certainly a bird and not a butterfly! Not too long ago, I wrote a post on the common English names of some butterflies in the region, and some theories behind how the names were coined. In that article, the names mainly came from military and aristocratic titles. 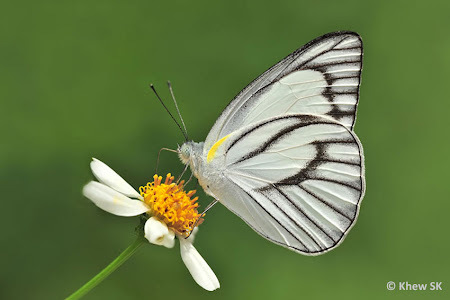 My recent experience in San Francisco reminded me that there are quite a few groups of butterflies that shared common English names with birds. A look at some of the literature available yielded a few groups of butterflies in Singapore that had names of birds. 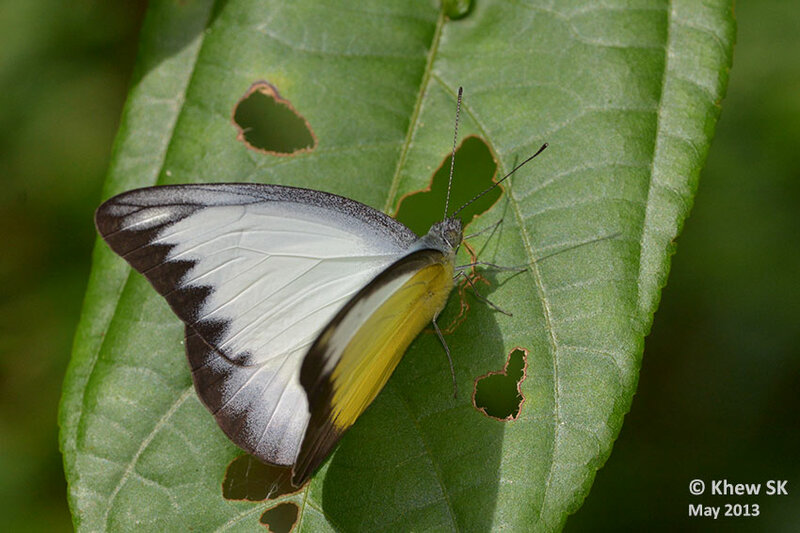 This article features just two groups of them - one from the Papilionidae family and the other from the Pieridae family that has common names that may confuse these butterflies with birds! There are others, which I will leave for future articles. The first group that will be featured in today's blog post, are the Jays. If we google the name "Blue Jay", and look for websites or images, chances that the search will feature more bird articles and images than butterflies. In the world of ornithology, the collective group Jays refer to several species of medium-sized, usually colourful and noisy, passerine birds of the crow family, Corvidae. In the image below, an image search yielded many photos of this pretty blue bird of which there are several different species in North America and Canada. A screen capture of images after googling "Blue Jay"
The Common Jay is found more regularly on the offshore island of Pulau Ubin where its host plants, Desmos chinensis (Annonaceae, common name: Dwarf Ylang Ylang), Michelia alba (Magnoliaceae, common name: White Champaca), Polyathia longifolia var. pendula (Annonaceae, common name: False Ashoka Tree), grow quite commonly. Its life history has been recorded in our blog here. 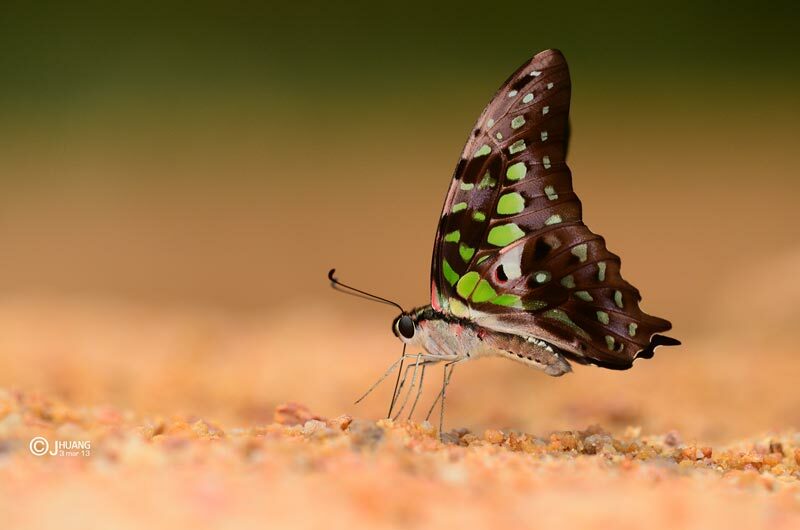 The third Jay is the green-spotted Tailed Jay. A common urban butterfly, the caterpillars of this species feed on the Soursop plant, amongst several other species of alternative host plants. This species is found in urban parks and gardens as well as in the forested areas of our nature reserves. 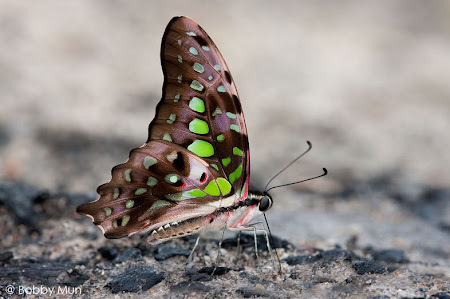 This is the largest species in the genus Graphium. Over in Malaysia, there are at least three more species of the same genus that bear the English common name "Jay". So the next time you are out in the field and someone shouts look at that "Jay", don't just assume that it is a butterfly that will fly past. Although in equatorial Singapore, it would be unlikely that it will be a bird! 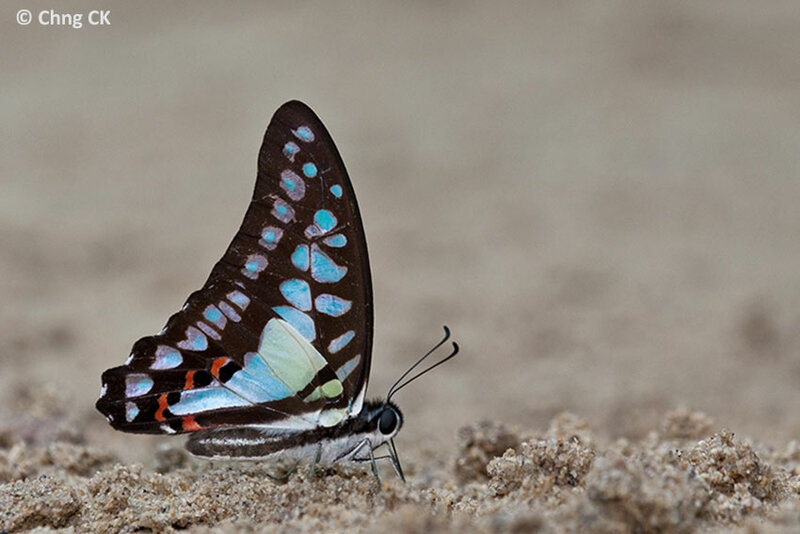 Perhaps the collector who first coined the name "Jay" for butterflies is most likely a non-local who associated the blueness of the butterfly with a bird from his home country? The second group of bird-butterfly common name is the Albatross. Again, from the ornithological viewpoint, the Albatross belongs to the family Diomedeidae. This family features magnificent birds that are usually associated with coastal habitats. Albatrosses are among the largest of flying birds, and the Great Albatross (genus Diomedea) has the largest wingspans of any extant birds, reaching up to 12 feet (3.7 m). A screen capture of images after googling "Albatross"
Although it is unlikely that we will encounter one of these large birds in Singapore, yelling out the name "Albatross" to a group of visiting bird watchers from temperate countries may invite curious stares and raised eyebrows! Two species of butterflies, the Striped Albatross and the Chocolate Albatross, occur here in Singapore. 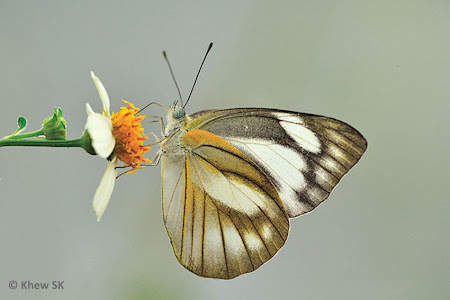 The Striped Albatross (Appias libythea olferna) is a common urban butterfly, that frequents parks and gardens on bright sunny days. The caterpillar of this species feeds on a common "weed" Cleome rutidosperma. The male butterfly is predominantly white, with black veins, whilst females have grey shaded wings. The Striped Albatross has a fast and erratic flight but is certainly less majestic than its gliding avian namesake. The Chocolate Albatross (Appias lyncida vasava) on the other hand, is seasonal and does not appear to be a resident species in Singapore. Up north in Malaysia, it is very common, and even seasonally abundant. During certain months of the year, the Chocolate Albatross may be observed in Singapore. At times, there may be several individuals seen together in local areas. The Chocolate Albatross is also a fast flying butterfly and in its native country Malaysia, up to 20 or more individuals have been often observed, puddling together at sandy riverbanks, together with other species of butterflies. 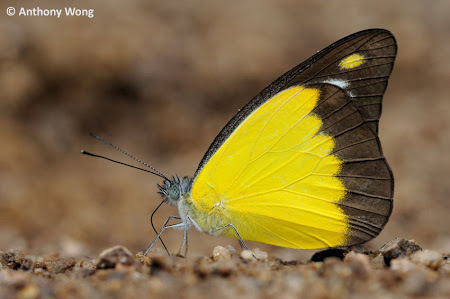 The distinctive bright lemon yellow hindwing in the male separates it from any other species of butterflies. Females are rare and often seen feeding at flowers and flying in the forested areas. So there you have it, two groups of butterflies that share common names with our feathered friends. 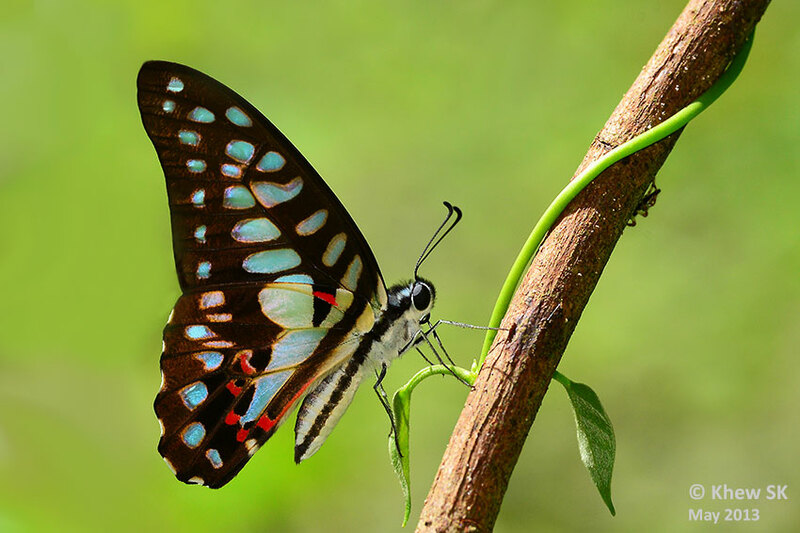 Although the similarities between butterfly and bird are hard to associate, it is likely that the Jays were coined as names for butterflies of the Graphium genus that are mainly blue, reminiscent of the blue coloured birds of the same name. For the Albatrosses, it is also possible that the butterflies, which are predominantly white when in flight, reminded the original author of the magnificent ocean-going birds of the northern hemisphere.